Temple Street says it currently has access to only one consultant cardiologist, with that consultant “only commissioned to one clinic per week”. THE NUMBER OF children on long-term waiting lists for heart consultations at Dublin’s only inner city children’s hospital has sprouted alarmingly in the last two years. Since December 2015, the number of people on the Children’s University Hospital Temple Street awaiting a first cardiology appointment has increased from 675 to 1,103 at end November 2017, an increase of 63%, according to the waiting list figures maintained by the National Treatment Purchase Fund (NTPF). 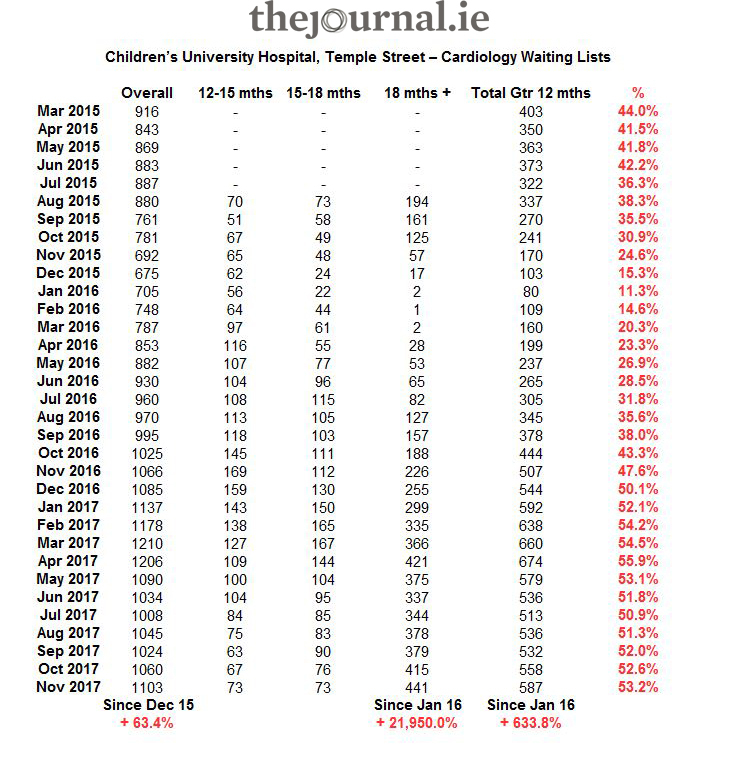 However, during the same time period, the percentage number of children on long-term waiting lists at Temple Street has increased to a far greater extent. 80 children had been waiting for greater than 12 months for a first cardiac consultation at the hospital in January 2016 – that figure had jumped a massive 634% to 587 by the end of November last year. Perhaps even more significantly, the number of children waiting for a consultation for more than 18 months has exploded over the same period – from just two children in January 2016 to 441 at end November (its highest level in any monthly breakdown that the NTPF has provided since March 2015) – an increase of a staggering 21,950%. When queried as to the size of the lists by TheJournal.ie, a spokesperson for Temple Street said that “all referrals (for cardiac consultation) are triaged by the consultant paediatric cardiologist with potentially urgent referrals given appointments first”. At present, the hospital says it “has access to only one consultant paediatric cardiologist”, with that consultant “only commissioned to one clinic per week at Temple Street”, suggesting the problem is very much one of resources. At that clinic, the consultant gives precedence to “all newly referred patients and all inpatients that require cardiac input”. “Any parent with a child who has been ill will know the stress that comes from watching their child suffer – that is heightened to terror when the child has a condition that can be threatening to their long-term health or their lives,” said Sinn Féin TD Peadar Tóibín, who first raised the issue of the hospital’s cardiac lists several months ago. Cardiovascular conditions are serious and often urgent conditions. There is no doubt that delayed diagnosis and treatment of the illnesses affecting these children is leading to significantly poorer outcomes. The news comes at the end of a trying week for the HSE and Minister for Health Simon Harris, with the numbers of people on trolleys in Ireland’s emergency departments smashing all previous records. On Wednesday, the Irish Nurses and Midwives Organisation’s (INMO) trolley count showed a new record high – the 2nd time in a matter of days – of 677 patients waiting on trolleys in public hospitals. In light of the huge numbers waiting multiple hours in those departments (perhaps attributable to an extent to the onset of ‘flu season’), the Irish Medical Organisation stated last week that “this chaos is the reality of our health services today”. 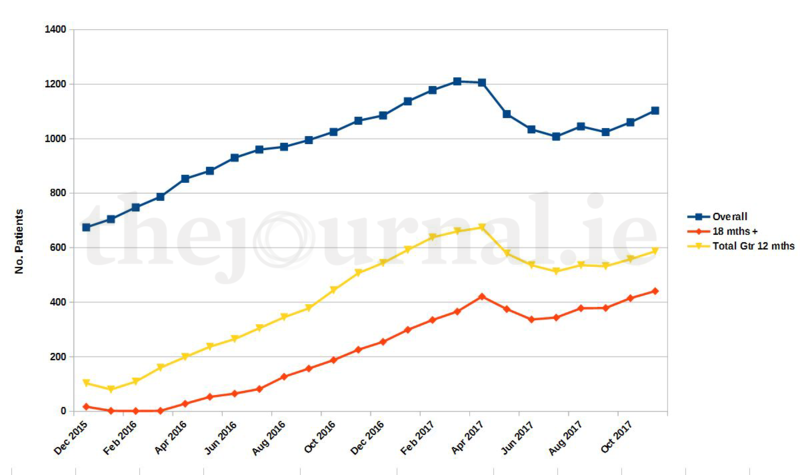 Regarding Temple Street’s cardiac lists, the trends seen are broadly in line both for the overall lists and the greater-than-18 months list, suggesting that the long-term backlog for cardiac care at the hospital is simply not being dealt with, and hasn’t been for nearly two years. Currently, the 587 children who have been waiting for greater than 12 months for a cardiac appointment account for more than half (53.2%) of the overall 1,103 people awaiting appointments at the hospital. By contrast, that figure was just 11.3% in January 2016 – 80 of 705 patients. The hospital, meanwhile, says that plans are in train to deal with the crisis. “Temple Street is in negotiations with the HSE and Phoenix Children’s Health (the new name for the Children’s Hospital Group) with regard to long-term solutions to reduce the cardiology outpatient waiting list and has submitted a number of business cases through the annual estimates process,” the spokesperson said. “That the overall numbers waiting has increased to such an extent in a time of so-called recovery is a clear example of this government’s distorted priorities,” said Tóibín. I have looked at the rate of increase in numbers waiting over 18 months and I still find them hard to believe. This is not happening by accident. Behind each one of these figures is a family. Simon Harris as a moral responsibility to investment the necessary resource to resolve this crisis now. Email “'Not happening by accident' - waits for heart services at Dublin children's hospital exploded in the last two years”. Feedback on “'Not happening by accident' - waits for heart services at Dublin children's hospital exploded in the last two years”.